Diamond Cherries is a classic slot game launched by Rival in January 2016 with a great design layout and a mouth-watering jackpot. The layout of this game has three reels with just a single pay line. You can choose from 1 to 3 coins, you should note that the value is from $0.01 up to $10, so the largest stake you can place is actually $30. This is remarkably low compared to other slot games which gives new players a chance to experience and play. Diamond Cherries Slot is played at 1 pay line, and you can adjust the number of coins by clicking the “select coins” button. One wild symbol completing the winning combination makes the prize double, while two of them act as a multiplier. (x4). Total winning amount is immediately transferred to the customer’s account by the end of the round. 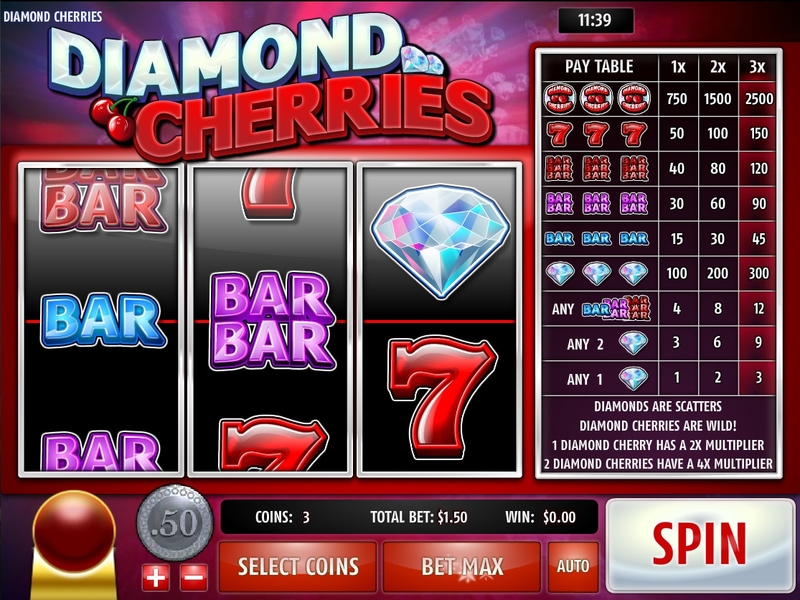 Diamond cherries slots has symbols these include; diamonds, bar, sevens and cherries. The diamonds like anywhere else is the most valuable possession on this slot screen as well i.e. the payout of this symbol is the highest as compared to any other else. Generally, they can show up anywhere on the reels to give you wins. Each diamond symbol gives you 3 times the bet as winning, and two symbols on the reels will get you 9 times. Three on the reels, even if they don’t all land on a single pay line, will earn you a handsome 300 times win, which is the second-largest payout available in this slot. The purple bar symbol with double bar pays out double that for a 90x win. Also you have a chance to win 12x if you line up any three mixed bars. A lucky seven that pays out 150x for three of a kind. The wild symbol is represented by diamond cherries which can make combinations on their own. They can also replace other symbols. Each of them doubles up a payoff like x2 for one Wild and x4 for two symbols. 3 diamond cherries on the reel will make you hit the jackpot. Diamond Cherries like other classic slot games has a disproportionate multiplier jackpot system. All of the payouts but the jackpot are scaled appropriately. For example, if you would get a 15x payout with one coin, you’d get 30x with two and 45x with three. So it is beneficial to bet three coins on each spin for higher winning chances. Similarly in case of symbols, one coin will get you 750x, and two earns 1,500x, but three earns you 250x extra which makes it 2500x on three coins. The denomination of the currency also doesn’t matter on this game, hence, even if you’re playing for pennies, make sure that you use the maximum bet of three coins. This three-reel game is addictive because scatters and wild multipliers drive the game. It has exceptional graphics and features that make it easy for beginners to understand the game and play. Plus the high payoffs make it a top slot game in the current lot. So spin the reel and let it roll!